College basketball is one of the rare public places where black men are allowed to cry. Central Florida senior Dayon Griffin wept in the handshake line March 24 after Duke stole a second-round victory, and the locker-room sobs of his teammates went viral. Kansas State players “cried like babies,” their coach lovingly said, after they were upset in the first round by UC-Irvine. 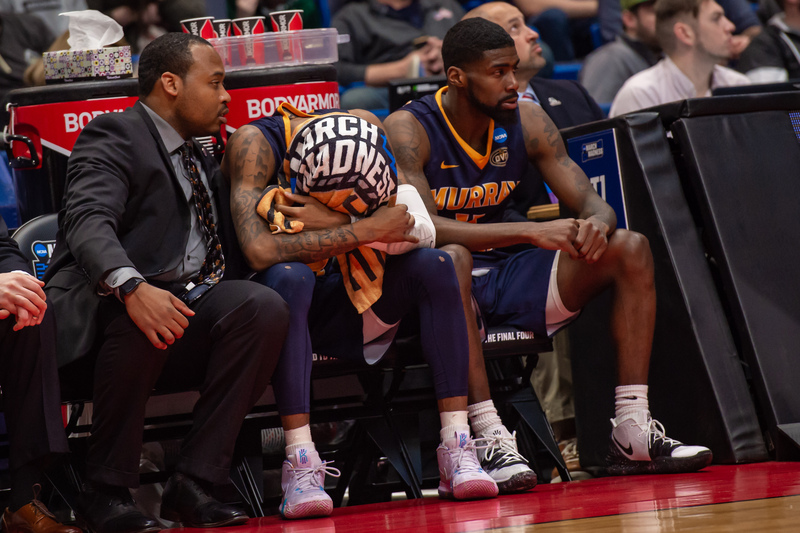 NBA-bound Murray State guard Ja Morant hid his tears under a towel as he exited March Madness. And that was only last week. In 2017, De’Aaron Fox and Bam Adebayo cried in each other’s arms after North Carolina sent the Kentucky Wildcats home from the Elite Eight on a last-second shot. In 2018, Fairfield coach Sydney Johnson wrapped his all-time leading scorer in a moist hug as he checked out of his final game. When Johnson was coaching Princeton, he shed tears on the interview podium after his Tigers lost to Kentucky, 59-57, in the 2011 NCAA tournament. Why do we grant permission to cry so freely in this particular venue? When black men are killed, we see more tattoo tears than real ones. It’s unheard-of for black men to cry in public if they don’t get into college or can’t get jobs. A brother would be ridiculed for crying on the job if he didn’t get a promotion. When mass incarceration disproportionately sends black men to prison, most of America remains dry-eyed, while the convicted and their families weep. We use “soul-crushing” more often to describe the loss of a basketball game than a black life. Perhaps America thinks basketball is the most meaningful thing these young black men will ever do. So we send the message: Feel free to show your pain — on the court. Murray State guard Ja Morant (center) hangs a towel over his head during the second half of an NCAA Division I men’s championship second-round college basketball game against Florida State on March 23 at XL Center in Hartford, Connecticut. Basketball is both more popular and more naked than most other sports. Not only do players wear less clothing, but because of the ticking clock and scoring frequency, there is a greater chance of emotional moments where a season, or career, hinges on one play. College football has more fans, but players are hidden under helmets, there are few win-or-go-home games, and outcomes are rarely decided in the final seconds. Pro basketball players don’t cry, except when they win awards or championships — those massive paychecks are a great security blanket. Today, black pop culture is dominated by rap’s stone-faced ethos. “I can’t see it comin’ down my eyes / So I gotta make the song cry,” Jay-Z rhymed. Drake felt the need to have his mom dispel accusations about his leaky eyes. On the screen, black male tears often come only when a man is stripped of everything. After his father abandoned him on The Fresh Prince of Bel-Air, Will Smith broke down only after trying to cope through jokes and defiance. Denzel Washington clinched his first Oscar playing a man with a soul so calloused, he sheds only a single tear during a vicious slave whipping. Barack Obama cried publicly several times during his presidency, and he was sometimes mocked for it or accused of faking. Michael Jordan let down his impenetrable guard for a moment while being inducted into basketball’s Hall of Fame, and he was punished with the GOAT internet meme. “‘Black males don’t cry,’ is a phrase I have heard my entire life from the media, peers and even family members. … It is as if black males try to avoid their own vulnerability and replace it with a sense of masculinity reinforced by society,” psychologist Aubrey Harrison wrote in the American Psychological Association newsletter. The concept of stoic masculinity is not limited to black men, of course. Matt Damon finally allowing his character to cry in Good Will Hunting comes from the same socialization as Derek Luke surrendering to his pain in Antwone Fisher. But this repressive construct can be exacerbated in black men who experience disproportionate and unique traumas while society gives them little, if any, sympathy. Hiding emotions is a survival tactic in a cruel world. Green probably would have been forgiven for crying over his team’s loss in Game 7 of that season’s NBA Finals. We understand that athletes pour everything they have into these games. We appreciate their skill, passion and commitment, and when it’s not rewarded, we extend our sympathy. College basketball allows us to empathize with the same young black men who get little love in the streets, the classroom or the workplace. Basketball allows us to see that beneath all their hair and tattoos and bravado, these are teens and young adults who deserve the freedom to make mistakes. This is the special sports sympathy that flooded over the UCF players who cried after leading top-seeded Duke by three points with 18 seconds left but lost 77-76. “We always said it’s gonna end two ways when you invest like we invest. We gonna end celebrating or we gonna end crying, we gonna end in tears,” head coach Johnny Dawkins told his sobbing players in the locker room. UCF Knights guard Terrell Allen (center) reacts after being defeated by the Duke Blue Devils in the second round of the 2019 NCAA tournament March 24 at Colonial Life Arena.